Get any better than, THIS? Wish I wrote it. Thanks, #Anon! 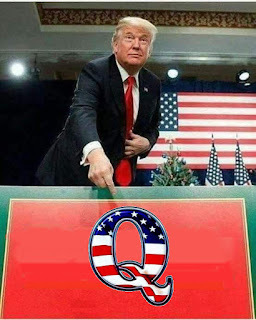 QAnonTalk.com - Full Homepage below read. So basically what this is all about is there is this huge cabal that is trying to run the whole world, with people as their de facto slaves, where they are above all the laws, which they basically already are. The cabal consists of the Red Shield, Saudi Arabia, and Soros and the zionists, this is the triangle. Those three very wealthy factions have been working together for years to undermine our country. Through every means they could, the banks, the media, the politicians, the judges and the intelligence agencies. They have pretty much accumulated a majority of people working for them in the manegerial positions of those means of control. This is what the deep state consists of. People working for the triangle. These people are controlled by greed and being paid off, or lust and they get set up in compromising positions a'la jeffery epstein pedo island, and then these people are subjected to blackmail and have to do what the cabal tells them to. A majority of the congress has been compromised. All of the media has been compromised. The intelligence agencies have been compromised. The courts have been compromised. They are all actively working to subvert the constitution. The government people involved in this have taken an oath to defend the constitution. They are breaking their sacred oath to all of us. We need to identify these people that are compromised and remove them from the government or the airways. They control the central banks of almost every country on earth, save North korea and iran I believe. They run all of the banks. They use fear to remove our liberties. They stage attacks and bombings to try to push an anti gun agenda. They sell drugs to fund black projects. They murder anyone credible who dares cross them. They try to divide us in whatever manner they can, race, class, gender, preference, politics, everything. They poison us in our food and our medicine. They hide cures to sell the more profitable treatment. They create disease to provide profit from cures. They create wars to sell guns and ammunition, military equipment is big business. Immigration of muslems meant to destabilize, not improve the quality of America. So much subversion and outright lies told to the public. Maybe Trump mentioning taking the guns first and due process second, was a trap to see who is in favor of that nonsense. Because that is clearly unconstitutional on so many levels. The people for that are obviously not working for us, who are they working for?